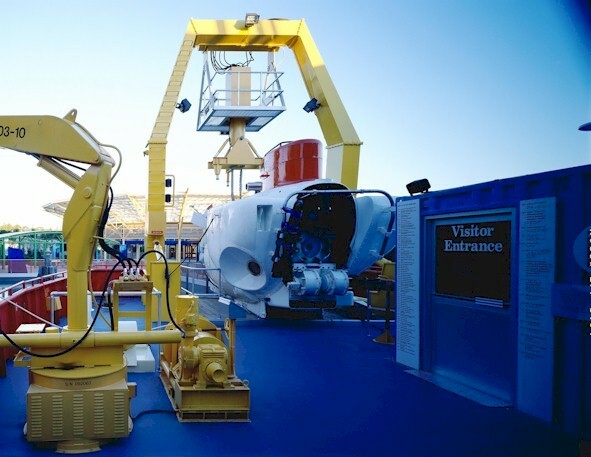 On an ocean exploration vessel, like Atlantis of Woods Hole Oceanographic Institute, it is possible to concurrently have a Submersible (untethered with 3 people inside) as well as a Remotely Operated Vehicle (ROV). Both vessels go thru a long pre-dive check to make sure everything will be operational at 10,000 feet depth. These activities are monitored inside a Control Van, which contains all communication, navigation, imaging and piloting control devices. We simulate all of this media and telemetry feeds in a physical control van at Mystic Aquarium. Visitors feel like they are in the middle of the ocean, observing 12 video feeds from the deck and hearing the engineers go through the pre-dive checks as the deck vibrates below their feet.